KNOCK OUT KAINE is a British Hard Rock band, formed in 2009 or maybe a little earlier, as they won Kerrang’s “Best New Unsigned Act” competition in that year. This led to gigs with ADLER’S APPETITE, playing at Download Festival, and sharing the stage with STATUS QUO. 2012 was the year of the band’s debut album, “House Of Sins”. Anno 2015 the follow-up was finally released under the title “Rise Of The Electric Jester”. KNOCK OUT KAINE’s music is said to please fans of AC/DC, VAN HALEN, MÖTLEY CRÜE, STEELHEART and many more. The album begins with “16 Grams Of Heart Attack”. The start reminded me a little of IRON MAIDEN, in that they have a similar kind of melodicness. Once it’s time to take off, it’s time to rock ‘n’ roll! Add the typical greasy vocals and you’ve got a recipe that can’t fail. Full power is reserved for the chorus, as backing vocals are added. The obligatory solo cuts the song in two. The intro theme returns at the end, giving the song a classic head and tail. “Fire & Smoke” starts in a groovy, Bluesy manner. Very catchy, indeed. There’s even room in this song for acoustic touches. Although this song is shorter than the first, the music prevails. “How Would I Know” starts off with an epic, marching intro. Poppy verses (dominated by the piano, drums and clean vocals; there’s rock in a second instant) contrast in a way with an übercatchy Glam chorus. “Diamond Blue” could be considered as a power ballad, has a Southern Rock-feel. Clean, groovy verses link up with a melodic, midtempo chorus. The whole sounds very American, I must say. Not that I mind, but this song was not as pleasing to my ears as the previous ones. But fear not, “Cascading” brings back the Rock, SHAKRA-style! Again the electric and acoustic guitar join forces. This upbeat song has a more positive vibe, I’d say. The chorus stands out here as well, and vocals are key. “Ain’t Your Kind” is where some AC/DC-influences are added to the album. It’s a slower rock song in which the guitar and organ team up. The mellow chorus contrasts with the more rocking verses. But all in all, another very good song. More Pop can be found in “Boxes”. This song begins with drumsamples, after which the guitar falls in. The music is very radio-friendly. Full-on Rock is activated in the chorus, and what a difference with the clean, funky verses. Good, but not super, in my opinion. Things are a bit better in “Flying Blind”, where the organ makes its return. This Rock ‘n’ Roll song has more drive, more push, while at the same time being radio-friendly. “Because You Were There” is a title which gives it away, doesn’t it? It’s a ballad, indeed. Not bad, not superb. Ballads are always a tricky business, very much taste-based and what not. This one reminded me a little of older JOE SATRIANI work. And I like what he does, but I’m not really fond of KNOCK OUT KAINE’s ballad. Last but definitely not least: “One More For The Road”. No, it’s not a DIO cover, but it does rock very much. It’s got the organ, it grooves, it’s flawless from start to end. 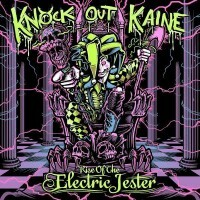 “Rise Of The Electric Jester” is my first acquaintance with KNOCK OUT KAINE. While I don’t regularly listen to this kind of Rock, i must say that the listening experience was quite satisfactory. These guys know how to make catchy and rocking tunes that can get the crowd going or give you a little boost when needed. “Rise Of The Electric Jester” is a very decent offering with which you can’t really go wrong.